Use Gordon Food Service liquid or powder (non-dairy) mix. Initial batch of mix takes approximately 70 minutes to freeze properly. Once about 2/3 of the ice cream is gone, pour in 2 more quarts, which will take approximately 20-25 minutes to refreeze. VANILLA SOFT SERV ICE CREAM 53 serv. 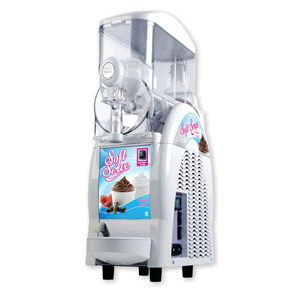 * Please call us for any questions on our dispenser ice cream frostie 15 amp rentals in Ft. Wayne IN, Warsaw, Syracuse, Auburn, South Bend, Indianapolis IN.